On Thursday, I got a great treat in the mail. It was The Knitter’s Book of Yarn by Clara Parkes, and marks the first release of a book that I wrote patterns for. There may have been childlike squealing. It was so difficult not to show these mittens as I was knitting them, because I was pretty darn excited. Thankfully, they’re free to be shown now. Double-Thick Mittens, knit in Alice Starmore Hebridean 2 Ply. The whole mitten is stranded, even the solid sections. You betcha they’re warm. They’ve got a picot hem, Latvian-style braid, and twisted, tassled strings to tie them together when not worn. The yarn is a woolen-spun heather, which contrasts the graphic design nicely, I think. Norwegian Snail Mittens, knit in super soft Dalegarn Baby Ull. 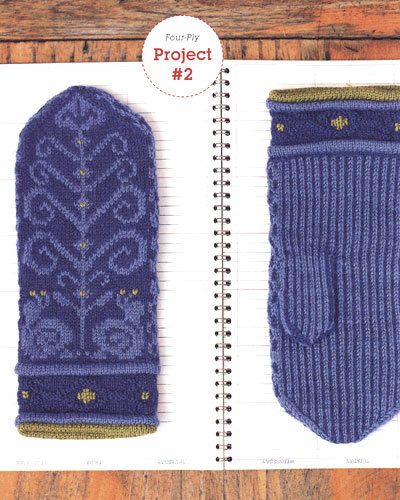 I can’t praise Clara enough for allowing me to make such an amusing mitten for her book. These have circus-tent striped palms, fanciful motifs, floops galore, duplicate-stitched kiwi green accents, knit/purl patterning, and SNAILS. This yarn is a smooth worsted-spun solid that shows the pattern to great effect. Mittens aside, this is such a wonderful book and I’m so proud to be involved. 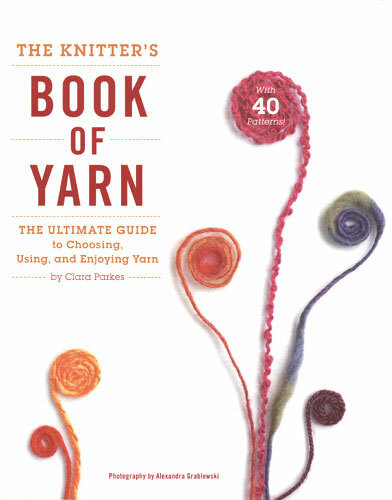 If you’d like to learn about fibers, yarn construction, properties, and selection for projects, this book is for you. The patterns aren’t half bad, either. ;) Right Amy? Amy has 8 patterns in the book! Rhinebeck was a total madhouse, mainly because I went with Jess and Casey from Ravelry and a bit of a hubbub follows them whenever they go near yarn-type people, but also because 12,000 people were there on Saturday alone. Being around Amy Boogie might have had something to do with the craziness, as well. Amy is like a force of nature, complete with a desire to party and a checkbook, all wrapped up in wool. She’s my kind of woman. I had a great time seeing old friends and meeting what seemed like 9,000 of the 12,000 people who showed up. The Ravelry party on Saturday was a ton of fun: I (well, the Fantom Bohus sweater) was felt up by many a knitter, and neither of us minded, the company was fantastic, and we closed that place down. I took literally one (bad) photo, but other people were much more prolific. Want to see some Rhinebeck photos? I’ve got lots of knitting to show. Cobblestone is done, and I knit a pair of legwarmers (!) in the van over the weekend. I knitting like a maniac on the Jackyll and Hide from the Fall 2007 Knitty. The plan is to frighten the life out of every trick-or-treater we get. Oh wow. I’m not sure if I’ve commented here before, but I just can’t keep my mouth shut about those mittens. They’re stunning! your mittens are great and it must be a lovely feeling. maybe one should get the book. Squealing if definately called for here. They are GORGEOUS!!! You have much to be proud of. This book is on my Christmas list. Congratulations! Those mittens are GORGEOUS! I’m very curious to learn how to create strands in the solid-color sections. Oh my goodness, I must have this book! LOVE your snails. It could be the kiwi green eyestalks… or just their overall cuteness. Hmm. well i already congratulated you on these patterns — when i saw them in the book, i knew right away that they were yours. sunday, i bought the book and clara graciously signed my copy. i haven’t gotten a chance to look through it yet, but it looks like it’s going to move up in my favorites list of books. It was wonderful to meet you in person. I hope someday you can come down to Philly. I would love to spend more time with you!!! Congratulations! My book arrived today and I was home sick, which gave me lots of time to look through it – your designs are wonderful and the book is just amazing. Can’t wait to see cobblestone..
good times, good times. And let me tell you (again), I’m totally in love with those double thick mittens. truly madly deeply. If only the weather would act like it’s supposed to. Be cold already! Mayarn needs a new pair of mittens! Wow! Awesome mittens. I haven’t tried making mittens yet probably because I live in California and we never ever need them. Glad you had fun at Rhinebeck. Curses. It hasn’t managed to reach Amazon UK yet. Those mittens are seriously fabulous. Oh my gosh! The snail mittens are killing me! Must knit them immediately. I would have not been able to be quiet about them for that long. So excellent! Congrats on having your patterns published and WOW those mittens are beautiful!!! The snails are so perfect! I’m ordering the book rightthissecond. I love your snail mittens. Congratulations on getting published! it was so nice to meet you out by the van on sunday. nice to have a friendly face to go with the beautiful yarn. :) hope i didn’t freak you out too much. heh. I *really* like those mittens. The tassled strings are a fabulous idea. And the snails are adorable. The mittens are great. I picked up the book at the Spirit Trail booth on Saturday and had it signed. It is full of some great patterns. Congratulations!! The mittens are fantastic! woo, congrats! I can’t wait to get my copy. I mean, the snails! Oh, the snails! Congratulations on being published! I love the mittens, both pair. I’ll have to make the stranded ones for me and the snail one’s for my kids. Because Mommy gets really cold hands waiting for those snail paced munchkins on winter explores! Please show us Cobblestone soon! I love both of these patterns so much! The little green bits on the snails antennae really takes the cake, though. I saw the mittens on Ravelry yesterday – they are going in to everyone’s queue – I can’t wait to get the book – Congratulations!! AWESOME mittens! Dadgum, I am just going to have to get over my fear of stranded knitting and do these! CONGRATS!! !Both are patterns I’d make in a heartbeat. Now I have to get the book! Congrats with the book. The mittens are beautiful. I’ve been in love with your mittens since before they were finished. The pictures in the book for them are awesome! It was great seeing you this past weekend. I only fondled once. I also meant to ask if you’d seen the pics of us on Purlewe’s flickr. Freakin’ hilarious. I love the “royalty” picture. I was already ready to buy the book because of the snail mittens, but your other mittens are the icing on the cake. I love Amy’s stuff, too, so off to the bookstore I go! Running into you within my first five minutes at Rhinebeck was definitely a highlight. And I meant to tell you how much I loved your sweater! Congrats on the patterns — I got the book yesterday and have already been admiring it. The question is, which mittens do I knit first? Beautiful!! I love the doublethicks! Congratulations on more lovely patterns! YAY!! Congrats! I heart those cutie mittens!! I love them! Congrats on two very cool (and beautifully photographed) knits. I can’t wait to get my hands on a copy! Congratulations, Adrian! I love the mittens, both of them. 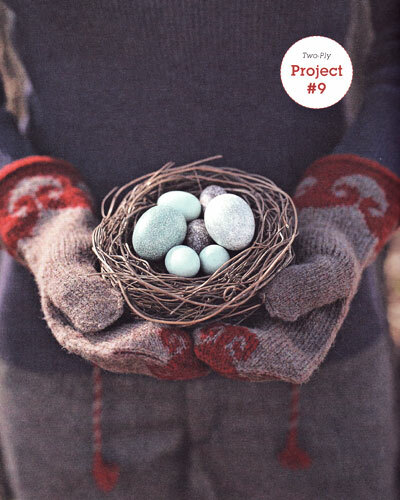 It took less than three minutes to order the book after seeing your snail mittens on Ravelry! I only realized from your post above that the green parts are duplicate stitched, and I’m breathing a sigh of relief.